Specifications for standard design optics follow. NOTE: Additional sizes and focal lengths can be manufactured on a custom basis. SUPERIOR TO PRODUCTION-TYPE SCHMIDT-CASSEGRAIN SYSTEMS? As you can see, the Ritchey-Chretien is several times better than the Schmidt-Cassegrain. • The lower the amplification factor of the secondary mirror, the flatter the field. • Ritchey-Chretien is coma-free, whereas Schmidt-Cassegrain is not. Production-type Schmidt Cassegrains use a spherical primary and secondary which do not correct for coma. Ritchey-Chretien has a hyperbolic primary and a hyperbolic secondary which correct coma. Ritchey-Chretien has less light loss. STAR INSTRUMENTS optics are of the highest quality and figured in our own facility by experienced opticians using modern equipment. Computerized polishing machines have been developed to improve optical quality of larger telescope mirror systems. Professional series optics are fabricated from Russian AstroSitall, which is a zero expansion glass, or upon request, Schott Zerodur, Corning ULE or Fused Silica. Pyrex is not a zero or low expansion glass and the homogeneous properties of the glass are not consistent enough to allow us to make high quality optics. Primary mirrors are fabricated using lightweight dish-type blanks or full thickness on request. 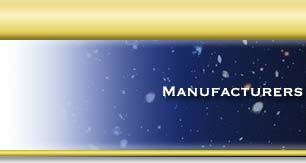 Completed optical systems are supplied without coatings. STAR INSTRUMENTS uses optical flats up to 41" in diameter to test in autocollimation all optics to insure excellent performance. A Zygo interferometer and software is used to provide hardcopy interferometric test data that is supplied with each set of completed optics. Back focus and spacing information is etched on the primary mirror, and the Star Instruments Job Number is etched on both the primary and secondary mirrors. 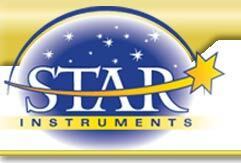 STAR INSTRUMENTS guarantees a minimum of 1/4 wave front, 1/20 wave r.m.s. on all systems. 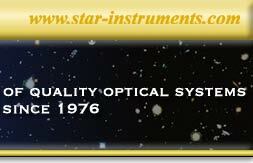 STAR INSTRUMENTS continues to be concerned with the false advertising claims being made by amateur optical suppliers who claim 1/10 to 1/20 wave optics. These claims tend to confuse the amateur astronomer into believing you must have 1/10 wave optics, when in reality there are very few 1/4 wave 8" and larger optical systems. The fact is that Pyrex is not a zero expansion glass and, therefore, cannot keep a figure better than 1/4 wave front.